The first “official” day of summer was June 21. But it’s been hot in Texas for years. I grew up in San Antonio, a city with the same latitude as Timna Park, Israel, which is just north of Eilat and the Red Sea. Hundred-degree Texas days bullied me like the kid across the street, but the Arabah Valley of Israel throws a harder punch. Especially from the Dead Sea south to the Red Sea, this valley burns hotter than any Texas summer I remember. As I gulped water from my CamelBak in Timna Park, drinking seemed as useful as pouring water on the ground. What a place. Scrubby acacia trees scattered around offered no shade; they reminded me of the thorny, leafless mesquite trees of Texas. Large, steep sandstone formations interrupted the otherwise flat desert, jutting up red and dark as if burnt from exposure above ground. And did I mention the forecast? Hot. 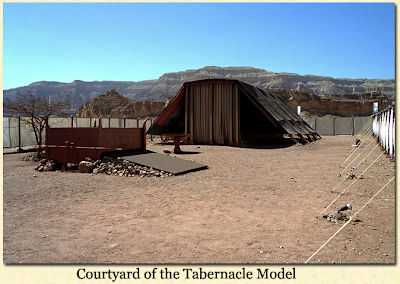 A Baptist organization had constructed a scale model of the Tabernacle that Moses carried around in this same wilderness for 40 years. Once in Eureka Springs, Arkansas, I saw another scale model of the Tabernacle, but that fiberglass structure looked more like a piece of modern art. The one in Timna Park looked like the real thing. 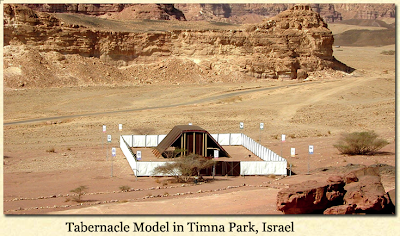 Skeptics have come to inspect the dimensions of the Tabernacle model at Timna only to find that it faithfully reproduces the proportions given in Exodus 35–40. But reading the description in Exodus can’t compare to standing outside what looked like the Tabernacle itself—and in the same wilderness! I felt as if I had walked through a doorway of history. Even though this Tent of Meeting offered a great glimpse of biblical history and could potentially attract a greater number of tourists, Israeli park information and most tour books mysteriously omit the Tabernacle’s presence in the park. Why? Probably because the Baptists are quick to point out to Christian tourists how the Tabernacle foreshadowed Jesus Christ. The book of Hebrews does the same (see Heb. 9:8-12). A soft-voiced college student walked our group to the front of the model. Dressed in period costume with Velcro sandals, he explained the history of the Exodus in such slow detail that some of us grew concerned for the elderly who stood in the heat. Beads of sweat formed on foreheads, water bottles opened and emptied, and people clustered in bits of shade as if sharing an umbrella during a downpour. As I watched the white curtains billowing around the perimeter of this Tabernacle, the ropes stretching out, staked to the unspoiled desert where the original tent stood—one event dominated my thinking. Matthew and Luke record the stories we read each December, but John’s account states the event so succinctly that no Christmas play could use it as its text: “And the Word became flesh, and dwelt among us, and we saw His glory” (John 1:14). The three-part crescendo begins with the inconceivable miracle of the virgin birth (really, the virgin conception): God became man. The term John uses for “dwelt” stems from a word meaning “tabernacle.” In other words, God became a man “and tabernacled among us.” The beloved apostle clearly compares the wilderness Tabernacle with Jesus’ life in the flesh. John climaxes his statement by saying that the same glory that filled the Tabernacle in the wilderness, the same presence of the Lord, also dwelt among men in the Man, Jesus Christ—still fully God but now also fully man. Jesus camped with us. And I stood in front of the perfect metaphor.